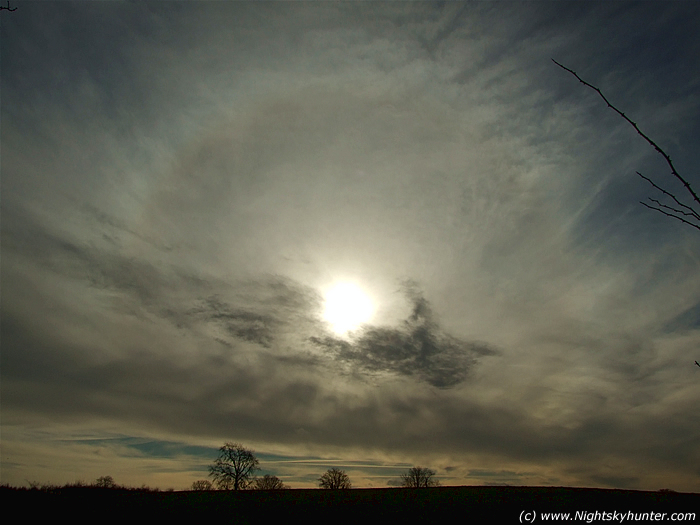 Beautiful 22 degree coloured sun halo on February 8th 2008 from the Maghera countryside during a sunny afternoon. Facing SW here looking across a very large field at the tree line on the horizon. Note the complex structure to the cirrus streaks around the halo and cirrocumulus above the halo's top. Crossing the scene below the Sun is a roll of cumulus. Settings: ISO100, 28mm lens, shutter speed 1600/second.